Vladimir Lenin once said that quantity is its own quality. Possibly, Lenin never so much as rested an eye on a four-wheel drive vehicle, but the phrase sure seems applicable. If you have enough of something, no matter what else you lack, you can surely get by. Russia had enough bodies, in Lenin’s opinion, to overcome its unique challenges. 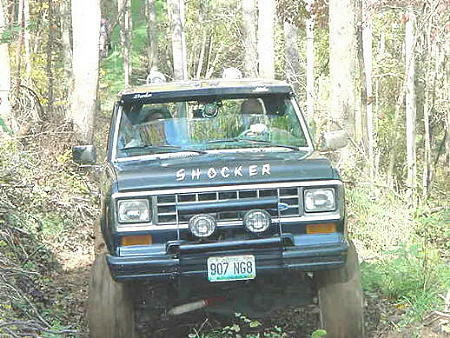 In our world, if you have enough rubber or enough horsepower or enough winch cable, or even enough ignorance-you can usually get by. Of course, Lenin never had to contend with the hills of southeastern Kentucky. 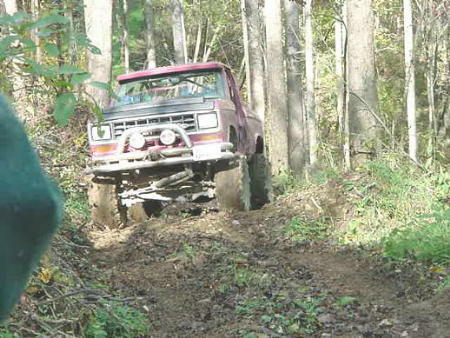 This was the first time I have gone wheeling without my truck and the first time I’ve ridden any distance offroad without my hands on the wheel and shifters. 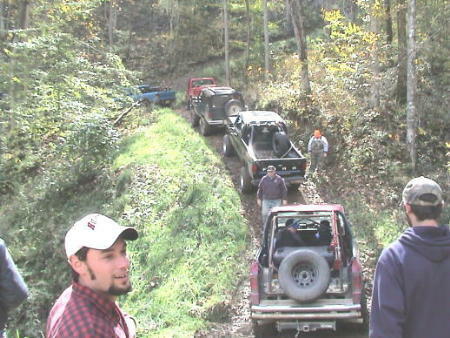 I hadn’t been to Sparkz place down in Hazard in a couple of years so I wasn’t quite up-to-date with the trail situation. It had been crowded when last I went-I think I drove about a total of a quarter mile. So I thought I would leave the Brown Thing at home and enjoy the hike through Sparkz’ beautiful landscape while I watched other guys churn up the loam on the short trail we had blazed two years hence. Well, I was quite surprised to see that a couple miles of useable, challenging trail had been laid in. 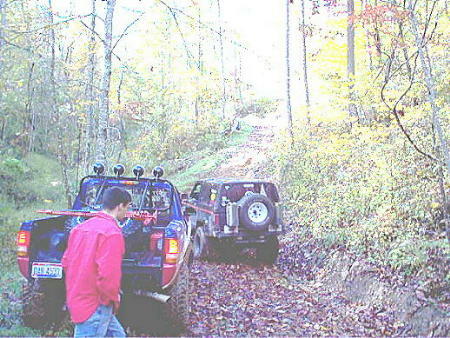 Sparkz had sold a little timber off of his 820 acre preserve and had cajoled the buyers into cutting some decent trails along the hillsides. But you should know that if you have enough quantity and actually make it up to one of these trails, you will be looking down on the tops of 80+’ trees. And then climbing even higher. You ever go out into the woods by yourself and just sit down and listen? It’s boring, right? So you start looking around and then pick up a stick and poke it around in the dirt. You notice old brown leaves on the ground. And then you stir them around a bit and find rotten leaves under the brown ones. And then you dig a little and find soil like thick black cake. That is loam and Sparkz has it in hundred foot high piles. It is sticky, and it is thick, and it is vertical. Don’t bring your MTRs and BFGs-that isn’t enough tire quantity. 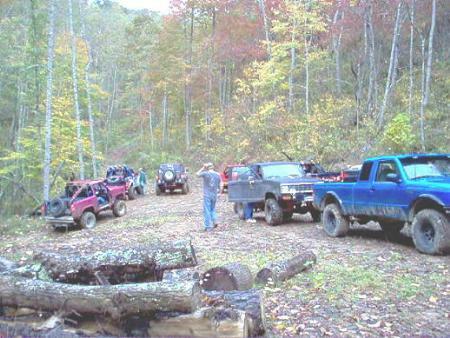 Bring your Swampers, bring your implement tires, bring your snow chains-hell, bring your tracks. Don’t bring your 2.9 if you don’t have the tire quantity-bring your 5.0. And if you have a decent motor and a decent set of tires and lockers-but a busted hub? 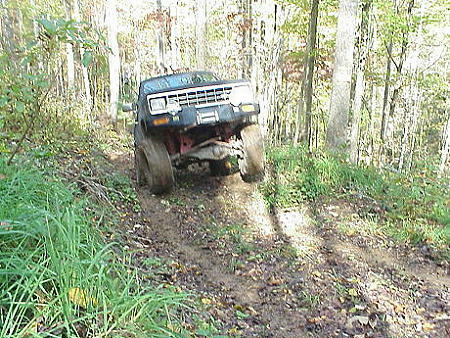 You are short 25% of the quantity of driving wheels required to even make the first climb. Isn’t that right, Jim? And if you don’t have enough of either of those? 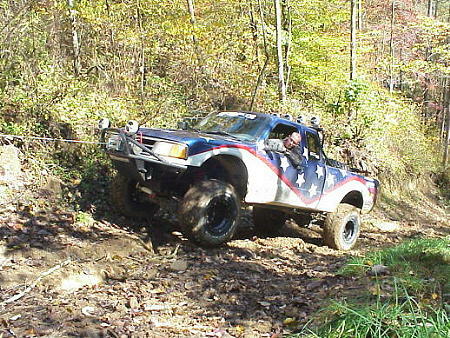 Bring enough winch cable or bring Sparkz the title to your truck as you might be leaving it there. The play-by-play doesn’t read as well as some other events, and pictures taken on hill-sides never come close to giving you an impression of how steep things are, so let me give you a few word clips. 1) You are sitting in the backseat of a Bronco II on 35s with a 6” lift with some guy that spends his frazzled life dealing with teenagers at the wheel. 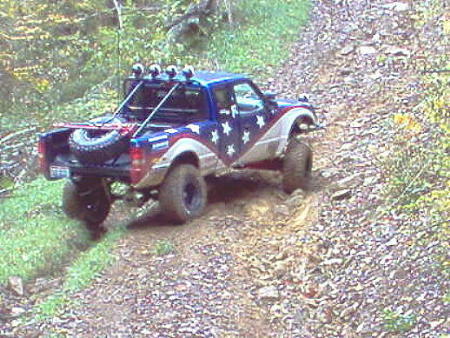 He has the pedal to the metal on a vertical climb and the front wheels are coming off the ground at every bump in the trail. Loose cans of soda are exploding right behind you and all you can see is the ceiling of the truck. Nice headliner incidentally. 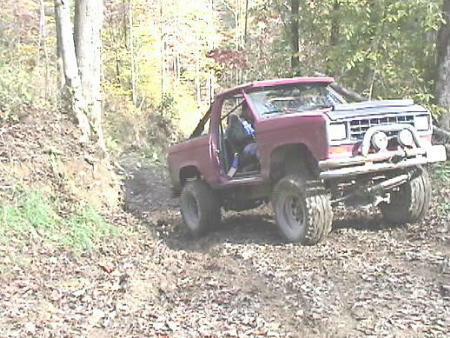 2) Same driver, but now it’s downhill and oh my, the truck only has 3.73 gears and it coasts at like 40mph. It’s all ski moguls and the suspension bottoms as each mogul cordially introduces itself and then the little Bronco is shot straight up to the top of the hump and feels like a circus elephant standing on a ball. Then it plunges off the other side slap at a tree and behind the tree is the top of an oak growing at the bottom of a dark green abyss. Then thank God that tree somehow dodges out of the way and after the next mogul collision there is a space with no trees and so this hurtling Bronco surges toward the cliff and is jerked away at the last moment and in that instant of imbalance…another mogul picks it up and juggles it into the air. And James-I have an appointment to get the seat cushion removed next week Thursday. I’ll send it back directly afterwards. So that is Sparkz’ place-all pedal and pucker. Large quantities of both are required. 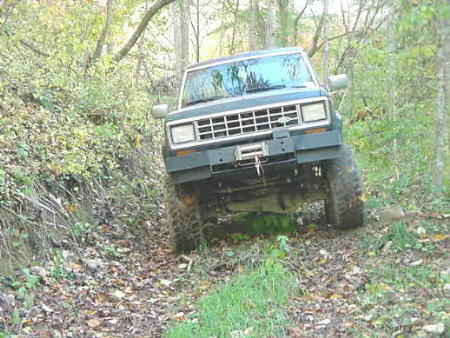 You can’t care about your truck and succeed. You lose nerve and you might find yourself at the bottom of a canyon that nothing short of a diversion of the Red River would get you out of. Luckily, the total casualties for the day were one fragmented hub, one busted taillight and a couple of nice dents. No matter how hard you try, nature is going to get hers. You just need enough truck around you to sustain the casualties and move on. Ain’t that right, Vladimir? Also, Special Thanks to Pat Campbell (AKA: Sparkz) for the use of his land!